Multiplying a 2 digit number by a 2 digit number can be done as mental maths. Mnemonics are one way to approach it. The left side digit of that 7 x 4 calculation needs to be remembered temporarily: the 'carrier'. the right side of each answer is what matters (and will be added to the carrier that was 2). that 2 plus that 6 equal 8; and add to that the carrier (from the early on 7 x 4 = 28) of 2 to get 10. Write the 0 as the second digit of the answer; and note the 1 (right side of 10) as a carrier. 3 x 8 = 24 (and the 4 needs adding to that total we were just looking at): 7 + 4 = 11. Write the right side 1 as the third digit of the answer; and use the left side 1 as a carrier. We now have 3108 . The effort to learn the results of some common calculations would speed up the process of doing these maths steps. The initial question is: 37 x 84 = ? What if the left side digits (3 and 8) are expressed as consonants; and the right side digits (7 and 4) are expressed as vowels? Two syllables would represent the multiplication question. The AA-ZZ letter pair system is a way of expressing syllables as people images. 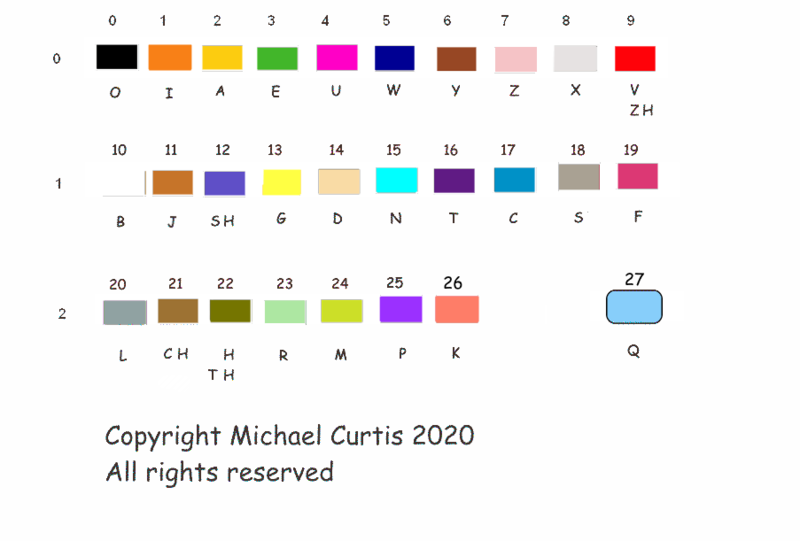 So what if I design the colours of the clothes of some of the AA-ZZ people so that the colour of a clothing top or of trousers indicates a digit of a multiplication calculation? I would also need to learn a system where I know rote that two colour digits added together give a result. What I mean is that when you do multiplication, you get carriers; and you often do addition to determine what digit gets put in a column of the answer and whether a 1 gets carried. The clothes top or trouser colour of AA-ZZ people would need to quickly lead to me knowing which digit goes in a column and whether a carry of 1 happens. KU and VA and KV and UA : mixing up their letters to represent the mini maths questions which need answering. I can then think of AA-ZZ system people KU, VA, KV and UA to mentally see their clothes colours. Those colours are essentially digits leading towards the answer. But I would mentally imagine a new person being constructed to represent the workings out of the answer. So the UA person's trouser colour is the right-most digit of the answer. I can imagine a shoe which is that colour. The KU person and the VA person need to have their trouser colours visualised and, by rote, to know a resulting colour from 'adding' those colours. The UA person's shirt colour is then 'added' to that to give the second digit of the answer. That is imagined as either a cat or a dog - depending on whether there is a carrier. Its overall colour is determined by the digit that belongs in the second column of the answer. So there is a coloured pet wearing a coloured shoe. If a carrier of 1 needs noting for column three's calculations then create leg length between the show and the torso of the pet cartoon. The shirts of the KU person and the VA person now get looked at and the carrier (leg length) is considered also. So is the trouser colour of the KV person. If a carrier of 1 is in the result then imagine a hat but if there is no carrier then imagine a scarf. The colour of the scarf or hat is the answer for the third column. Considering if there is a carrier, use person KV's shirt to get the answer to colum four (add 1 to it if there is a 'hat' carrier). So now, stating that digit and then stating the colour of the hat/scarf and the colour of the pet and the colour of the shoe is the answer to the multiplication question! the rote learning of which colour and possible carrier occur when two colours are 'added' is a discipline which someone would need to study to make this system workable at speed. I would be able to use 100 people the AA-ZZ people system for this clothing colour approach to work. I would say that letters V, W, X, Y and Z represent vowel sounds 'yue', 'oo', 'ee', 'ie' and 'ay' so that 'vowels' can cover a ten digit range. Note: Another way to quickly know the mini results of multiplication is to use words where the left half of the word is the consonant and vowel of what needs multiplying; and the right part of the word is the multiplication result. Or the technique could be applied to another operation on digits such as subtraction.